Sell locks, win a video camera. Take a winning video, get published in Momentum Magazine. Lexco is sponsoring a Kryptonite supported contest featuring the popular Kryptonite Modulus cable lock. All IBDs need to do to win is to be a top-five seller of Modulus locks from now until June 30th to win a video camera. With their new video camera (or any video camera) a dealer can then make a video of the innovative Modulus lock in action and be part of a Kryptonite ad that will appear in a future issue of Momentum Magazine. The Kryptonite Modulus locking system features a continuous locking cable that is perfect for quick-locking a bike's frame and both wheels. The Modulus 1018S Security System includes one coiled, continuous cable that is 3/8" thick and six feet long. Also, included are a lock head, two keys and a bracket transport system. The Modulus 1010S Security System features two noose cables that are 3/8" thick and 3.5-feet long with lock head, two keys and a bracket transport system. "We wanted to make it fun for dealers to order and sell the innovative Kryptonite Modulus System, and we thought a contest would be the perfect vehicle," says Karen Peterson of Lexco. 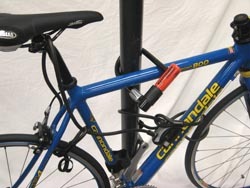 "The lock has been a great seller for dealers and is very popular with cyclists who are looking for a safe, secure and quick system for locking their bike and wheels. What's neat about the Modulus is its exclusive design that allows the user the ability to customize the lock with a choice of cable styles and lengths." Says Eric Anastasia of Kryptonite: "The Do-It-Yourself spirit of Lexco's dealer video contest is in keeping with the most important feature of the Modulus concept. It gives the end-user the ability to create a custom solution to his or her own specific lock up need. I know Lexco works with some very creative dealers and I'm excited to see the videos they shoot." During the contest, Lexco is offering IBDs special pricing on Kryptonite Modulus locks. For more information about the Lexco 2010 Kryptonite Modulus Lock Contest or to get the new Lexco 2010 product catalog, contact Lexco at (800) 626-6556, or e-mail sales@lexcobike.com.